This site is updated Monday through Friday. Please follow our Guidelines For Submissions, if you would like to be considered. All music is for sampling purposes, and not for sharing. If an artist would like any track to be taken down, I will happily comply. Thanks. Creed "We're Gay Oh Yeah Assholio"
The last time a mixtape has caused such a stir was The Grey Album, but Terry Urban's Southerngold isn't remixing the Bealtes. 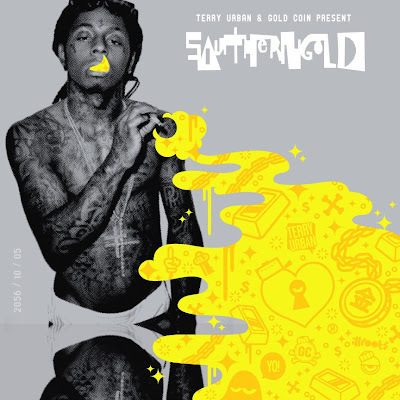 Southerngold is a mixtape inspired by Santigold's self-titled debut album, which like The Grey Album, Urban recycles the instrumentals and dubs his favorite southern rappers over the beat--hence, Southern-gold. So clever, so fresh, so clean. Before Urban could upload the album, he received a cease and desist notice from Santigold's label, Downtown Records. Attached in the zip file for the mixtape, Urban included a note describing the situation, "I’m not selling this… I’m not making a dime… I’m encouraging everyone to BUY Santigold’s album… and I’m helping to expand her fan base to new markets." The irony as Urban points out, Downtown Record's biggest artist is Gnarls Barkley, comprised of Danger Mouse (responsible for the Grey Album) and Cee-Lo. Santigold recently responded to Urban in a Pitchfork interview stating, "Some kid just hit me up about this on MySpace. It was the first I ever heard about it. I've never heard anything about this DJ or this remix, and certainly did not send a cease and desist letter. I'm a supporter of mixtape culture and intend to get to the bottom of it." The mixtape is pretty tight. If you're interested in grabbing it before it disappears off the internet, then check it out here. Below are samples of some of the tracks. did you ever check out the diplo mixtape top ranking from last summer? i have it for you if you don't, cause you should.